We all contribute to the health of Hamilton County waterways. Hamilton County Public Health is working with the Storm Water District and Soil and Water Conservation District to monitor the health of Hamilton County waterways. The Health District operates the hotline (513) 946-7000 that residents can use to report storm water pollution. The Hamilton County Storm Water District was established in March 2003 to meet the requirement of water quality set down by the Ohio EPA through the National Pollution Discharge Elimination System (NPDES) Phase II program. To better understand what this means and to learn about the Storm Water District’s activities, visit their website. A watershed is an area of land that drains into a common body of water such as a stream, lake, or wetland. Everyone in the world lives in a watershed. What we do on the land has a direct effect on the quality of our waterways. Water quality is a top environmental concern for Americans. Since the passage of the Clean Water Act in 1972, point-source pollution from industrial areas and sewage treatment plants has been greatly reduced. Today, increasing water quality problems are from non-point sources of pollution and storm water discharges. Did you know that every single person in Hamilton County contributes to the quality of county waterways? That’s right; the actions we take as individual citizens contribute to the health of the streams, rivers, and ponds that cross our county’s landscape. If this is news to you, then you probably don’t know that there are things you can look for in your community, and steps you can take in your own back yard that will help protect Hamilton County waterways for years to come. For example, everyday activities such as working on your lawn, washing your car, and sprucing up the exterior of your home can cause storm water pollution and can negatively impact the quality of our waterways – if we don’t take proper precautions. The average homeowner applies seven times more chemicals to their lawn than a farmer does per acre. Excessive application of fertilizers and pesticides on our lawns can be washed away by sprinklers and rain, ending up in storm drains that empty into the nearest stream or waterway. Many of us try to save money by changing our automobile or lawnmower’s oil, antifreeze and other fluids. Do you know how to properly dispose of these used products? Most of us know that these materials should never be dumped into a storm drain or waterway, but we may still unwittingly contribute to storm water pollution if we change these fluids in our driveways. Rain water or hoses may wash excess into the stream and down the storm drain. Leaky vehicles that are parked outside can have the same negative effect. There are many things we should and should not do as residents of Hamilton County to protect the health of our waterways. Simple things like removing pet waste and grass clippings from our yard and making sure our septic systems are functioning properly can all have a big impact on our streams and rivers. Dispose of pool and hot tub water and backwash properly: use our guide. Cover and seed all bare soil and preserve stream side vegetation – sediment is the #1 water pollutant by volume! Compost yard waste, sweep up grass clippings and tree trimmings from pavement. Hamilton County residents can drop off their yard trimmings for free at specified drop-off locations. Click here for more information. Clean up pet waste from your yard and when you walk your dog. Flush it or send it with your household garbage to the landfill. Maintain your household sewage treatment system. For maintenance and inspection information, contact (513) 946-7800 or Click here for more information. Store oil and other automobile supplies properly – containers should be tightly sealed. Click here for more information. Take old paint, pesticides, automotive fluids, and batteries to a hazardous waste handling facility. Hamilton County residents can drop off household hazardous waste for free at specified drop-off locations. Click here for more information on household hazardous waste. Wash your car at a commercial car wash or on a non-paved surface to avoid draining into the storm sewer. Keep storm water on your property through use of rain gardens and rain barrels. Pick up litter whenever and wherever you see it. Click here to go to Take Back Your Home. TAKE Back Your Home is a partnership between Hamilton County Recycling and Solid Waste District, Hamilton County Soil and Water Conservation District and Hamilton County Public Health to help you Rethink Hazardous Waste. Dumping excess soil, lawn clippings, leaves, or tree trimmings along stream banks, over hillsides or into the street. Dumping anything into storm drains. Report anyone who dumps chemicals into storm drains by calling the Storm Water Hotline, (513) 946-7000. Storm water that enters these drains generally flows untreated into local waterways. Overuse fertilizers and pesticides. You can test your soil to determine the amount needed and when to apply. Kits are available from Hamilton County Soil & Water Conservation District, (513) 772-7645. The Hamilton County Soil and Water Conservation District is looking for volunteers of all types, Boy or Girl Scouts, Community Groups, School Groups, or individuals to participate in storm drain labeling events. Participate in these community events will help build awareness among your neighbors and spread the message that our community is made up of good environmental citizens. For more detailed information, visit https://www.hcswcd.org/get-involved.html. Storm Drain Labeling – Storm Drain Labeling is a one or two-hour event that takes place in your neighborhood. Volunteers attach labels reading “No Dumping” onto storm drains and pass out door hangers to increase awareness that storm drains empty directly into streams without being treated. With that knowledge, residents can make informed decisions about disposing of household hazardous waste, like motor oil, and will understand the direct effects of pesticides, fertlizers and litter. For more information or to schedule an event in your neighborhood, please contact Adam Lehmann at (513) 772-7645 or adam.lehmann@hamilton-co.org. Watershed Signage – Where does that stream flow? – Understanding that every stream is part of a larger system is the first step in taking ownership of the role everyone plays in water quality. These signs identify and name local streams and the watershed it drains to. For more information or to schedule an event in your neighborhood, please contact Adam Lehmann at (513) 772-7645 or adam.lehmann@hamilton-co.org. Stream Clean-ups – The Storm Water District organizes and participates in several stream clean-ups along the Great Miami River, Little Miami River and the Ohio River each year. If you would like to be notified of these events, call Adam Lehmann at (513) 772-7645 or adam.lehmann@hamilton-co.org. Excessive soil erosion or runoff around development, construction sites or agriculture fields. Polluted storm water can lead to fish kills, destruction of wildlife habitat, loss of aesthetic value, impaired recreational areas and contaminated drinking water resources. 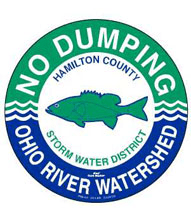 You can help keep Hamilton County waterways clean and clear by reporting and preventing possible sources of storm water pollution. Call the Hamilton County Storm Water Hotline at (513) 946-7000.